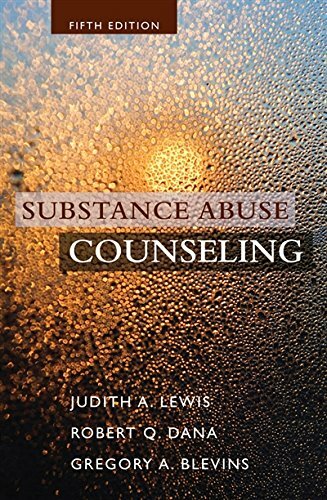 1285454375 -SUBSTANCE ABUSE COUNSELING, Fifth Edition, provides a sound, practical overview of substance abuse counseling. The book is at the cutting edge of the addiction field, combining a focus on the most current empirical studies with a firm belief that clients must be treated with a collaborative and respectful approach. These core values lay the basis for individualized treatment planning, attention to the client’s social environment, a multicultural perspective, and a recognition that client advocacy is part of the counselor’s role. The authors believe strongly that clients differ not only in the specific behaviors and consequences associated with their drug use but also in culture, gender, social environments, physical concerns, mental health, and a host of other variables. Using an integrated approach, they describe innovative methods for meeting clients’ needs through personalized assessment, treatment planning, and behavior change strategies, showing readers how to select the most effective treatment modalities for each client.